Sunnyside Yard was built by the Pennsylvania Railroad as part of its massive New York Extension, the centerpiece of which was Pennsylvania Station in the heart of Manhattan. Opened in 1910, it is still the world's largest railroad passenger car storage yard. At the height of its operation in the 1930s, there were 79 tracks, with a capacity for 1,100 cars. 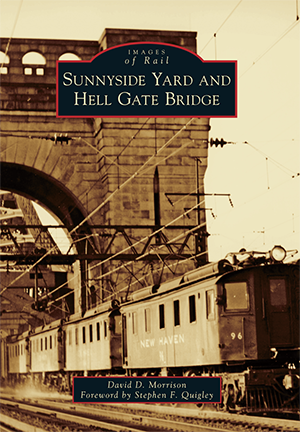 Hell Gate Bridge was a joint venture of the Pennsylvania Railroad and the New Haven Railroad to construct a direct rail route for trains between New York City and the New England states. The main span is 1,017 feet between the towers, and it rises more than 300 feet from the East River to the top of the towers. David D. Morrison is a retired branch line manager of the Long Island Rail Road, railroad historian, and current cochairman of the Oyster Bay Railroad Station Restoration Committee. He is a charter member of the Railroad Museum of Long Island, as well as the author of five other books, including three Images of Rail titles: Long Island Rail Road Stations, Jamaica Station, and Long Island Rail Road: Port Jefferson Branch.